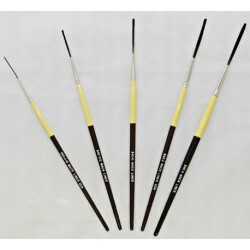 Buy Mack Brush Series 840 Outliner Brushes here, these brushes are made with synthetic squirrel hair here. This is a new synthetic that gives you the benefits of a natural haired brush. It is a soft hair that holds a lot of paint and gives you a good snap. outliners, out-liners, liners, letter out liners. outlining brushes, pinstripe out lining brushes, mack brush outliner. Individual Brushes LISTED BELOW!